Open Europe: Another cold front on the way from Europe? Ofgem's 'Electricity Capacity Assessment', published today, makes for some interesting reading as we enter the winter. 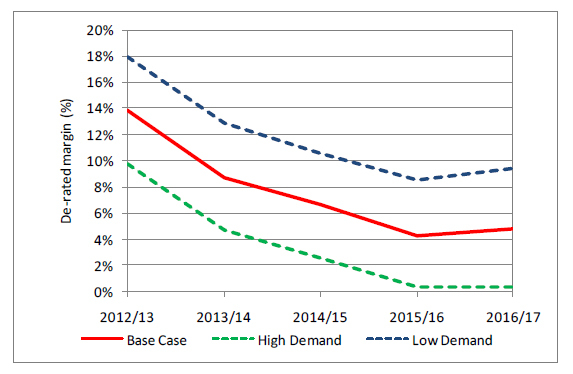 The high level of spare capacity in the GB electricity market is set to end quite rapidly over the next few years. As identified in our 2009 Project Discovery analysis the impacts of replacing older coal and oil power stations under EU environmental legislation together with changes to the generation mix over the next decade pose new challenges to security of supply. Recent developments have strengthened this view. Indeed, power stations 'opted out' under the [EU's Large Combustion Plant Directive] are using up their running hours faster than expected: most LCPD opted out plant will come off the system well before the 2015 deadline. In short, a mixture of EU environmental legislation and a change in the UK's energy mix, also driven in large part by EU renewables targets, means that the UK's spare energy generating capacity could fall from 14% now to only 4% in three years, under Ofgem's baseline scenario. 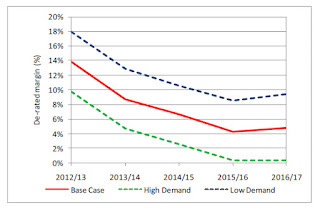 The graph below shows that in a 'high winter peak demand' scenario, the situation could get far worse, with the UK having no spare capacity in 2015/16, which could very likely to lead to blackouts. So, as well as trying to get a lot more gas and nuclear power stations built, the UK Government may also need to choose between complying with EU environmental legislation and keeping the lights on. The EUSSR -- a Fascist organization -- should have no say in how the UK - a supposedly free nation -- assigns or expends its energy. The fact that it does is a disgrace to us all. All the more reason to leave the EU. Those continental bureaucrats are NOT the UK's friends. They are not even friends to their own constituents. The EU is driving Europe into bankruptcy, poverty, and (we thought we would never say it) war. The crunch will come when people are freezing to death from a combination of excessive prices and power-cuts, while power stations perfectly capable of supplying the energy needed stand idle. How long do you think any Government would survive in those circumstances if it did not swirch them back on? Is someone arguing that global warming is not happening? Is someone arguing that we are not putting more CO2 and CH4 into the air? Is someone arguing that CO2 and CH4 are not greenhouse gases, and therefore are not adding to global warming? Obviously we do need to reduce emissions. But we do not need to take orders from the EU: they are achieving no reductions, other than by slowing down the economies. @ Rollo - Sorry been away. Nobody disagrees with your questions about Co2 CH4. We produce less than 2% of world emissions.The BRICS and China produce more than that EXTRA every year. Even if we reverted to coal with current carbon capture technology, we wouldn't make any significant difference to world emissions, we are a very small country. The nub of the problem is that global warming is not being tackled by competent technologists but by grandstanding politicians and those technicians specifically appointed by them to support their political positions. Not easy to see how to get out of this but Idris Francis may have hit a useful button in pointing out that any government who ends up presiding over ever increasing energy prices followed by power outages will become unelectable. Once that has happened all the EU forum bragging rights in the world will be meaningless. There is a great deal of sound science which says that man-made global warming is insignificant, most important greenhouse gas is water vapour, but no money in proposing to limit it!! Sound science and politicians capable of understanding it are urgently needed. Climate change has always happened-it is a continuous process. Arctic ice was disappearing 90 yeras ago!! !